The Drexel University men’s basketball team traveled to South Carolina to play the College of Charleston Jan. 10. Coming into the game the Dragons had a record of 7-10, including going 1-3 in the Colonial Athletic Association conference. Charleston, on the other hand, came into the game with a strong record of 13-3 including an impressive record of 2-1 in CAA conference play. Drexel found themselves in an early hole at halftime, trailing by eight after several defensive lapses. Despite the early struggles, graduate transfer Trevor John was able to keep the Dragons in the game with 16 points, including four three-pointers in the first half. Drexel came out looking sluggish after half time as well, and by the 8:20 mark trailed by 13 points. Given the early effort, it looked like Charleston could pull away. 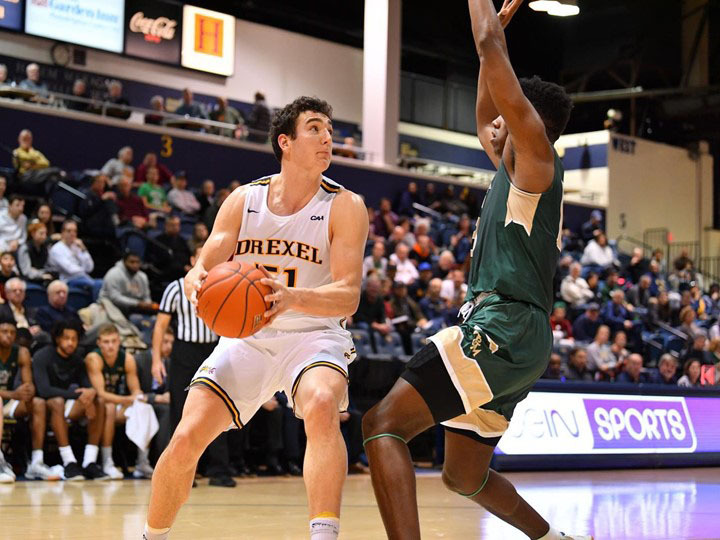 Drexel head coach Zach Spiker rallied his team though, and the Dragons quickly went on a 9-0 run thanks to three-pointers by John and junior Alihan Demir. With just under three minutes left in the game the Dragons were trailing by seven points, Spiker turned to his reliable senior Troy Harper. Harper scored two layups and added five free throws in the final three minutes of the game to grab Drexel a lead that would not let up. Two of his five free throws came in the final second of the game after he was fouled on a three-pointer. Harper’s heroic efforts led to a final score of 79-78. Drexel’s victory ended Charleston’s six-game winning streak at home. The Dragons’ next game came against the University of North Carolina Wilmington Jan. 12. The first half was a seesaw battle and the Dragons only lead by two at halftime. The second half was a different story as UNCW went on a 17-2 run after being down by seven early in the half. Junior Kurk Lee led the Dragons in scoring with 19 points, including five three-pointers. Despite this, the Dragons could not keep up with UNCW senior Devontae Cacok who scored 24 points to go along with 12 rebounds. The Dragons fell to UNCW by a score of 97-83. The Dragons now have a record of 8-11 including 2-4 in CAA conference play. The Dragons’ faced Towson University at home Jan. 17 ending with a score of _____. Their next game is the Homecoming game against James Madison University Jan. 19 at 2 p.m.